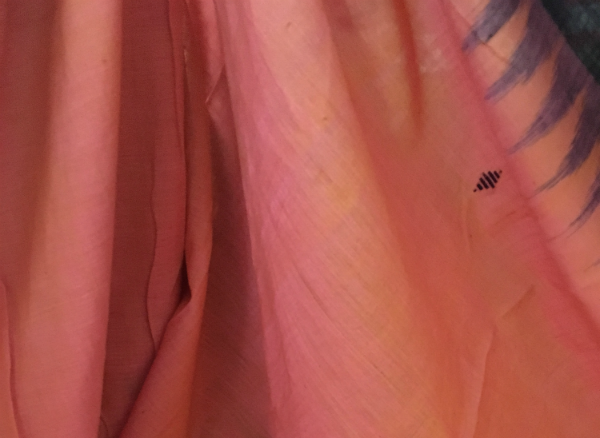 it’s a favourite saree of mine, and now it’s fraying. a strange kind of pain at this weakening of closely entwined threads, at this clear signal of mortality, at passing. 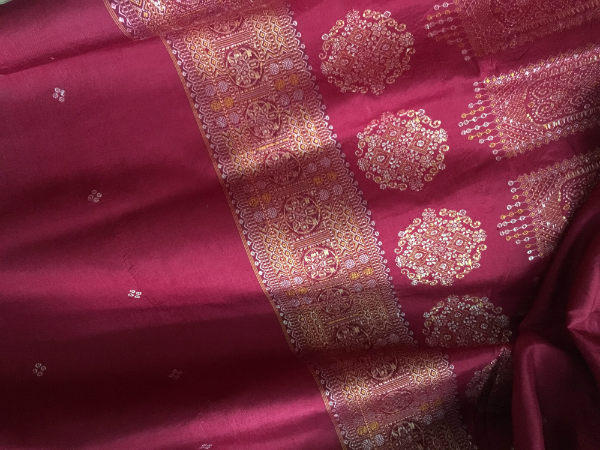 it’s a saree from orissa, now the spelling has been changed to odisha; we spend a lot of time changing spellings for some reason. 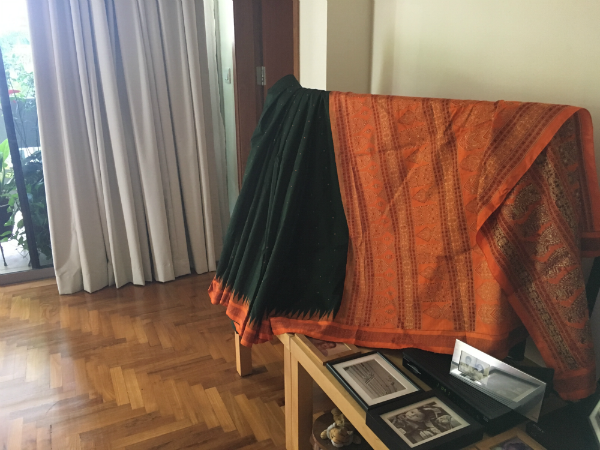 my mother and i bought it, around thirty five years ago, from one of the saree shops along triangular park in kolkata (we changed that spelling too, used to be calcutta), i think it was vashdev tolaram, the soft spoken and pleasant owner showing you the sarees patiently, the prices always reasonable and a good bit less than the neighbouring k bhojraj’s, where the sarees were often a shade trendier and always more expensive. 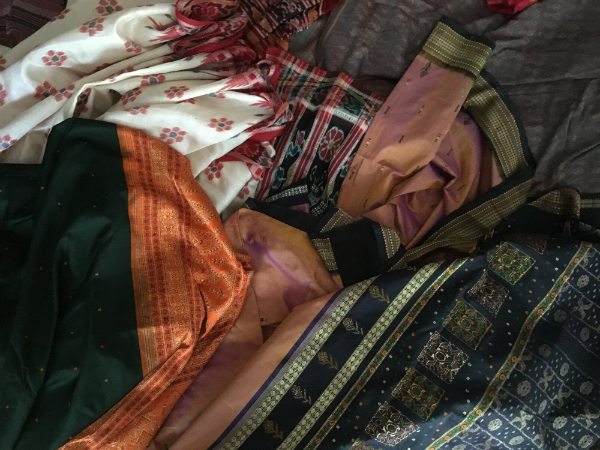 there was this plan i had of acquiring a saree from every state when i got married, and that day, we had gone looking for a kotki… a saree from orissa. 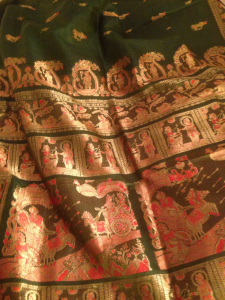 back then, i think we called all sarees from the state kotki, after cuttack, one of its largest cities. soon bomkais were the rage, i still remember the beautiful black, red, and white ones hanging in the show windows along triangular park and gariahat. 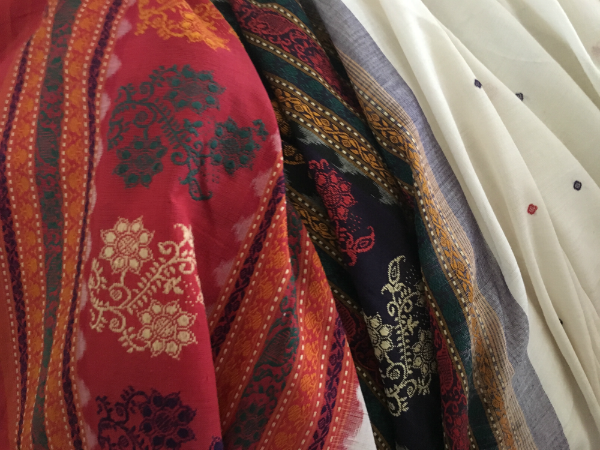 then i heard of sambalpuris, berhampuris, kotpads; there were several weaving centres spread across odisha, and they all had different styles and preferred motifs. 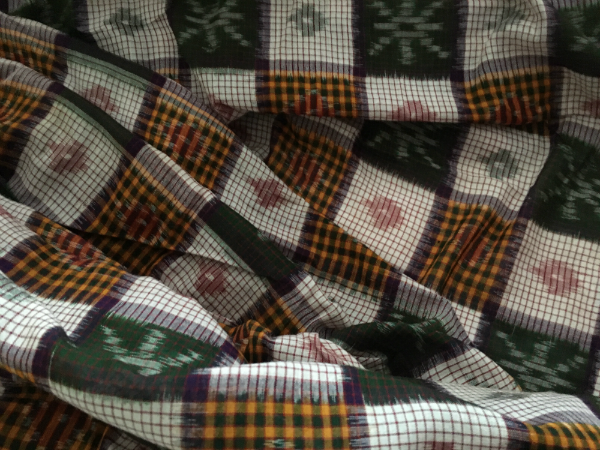 recently realised the odisha sarees with the checkerboard pattern are called pasapalli; pasa or pasha is the game of chess. i wondered if the pasha game that was to lead to the battle of kurukshetra, the spectacular confrontation between right and wrong, was the inspiration for this motif. it was here in odisha, more than two thousand years ago, that another war had brought one of the greatest conquerors to a life changing moment. in ancient times, most of present day odisha was known as kalinga. it is said that looking at the blood soaked battle field of kalinga, ashoka was aghast. he turned away from violence and embraced buddhism, committing himself to peace. of course, this dramatic change in emperor ashoka is robustly argued against too by eminent historians, who feel the transformation didn’t happen quite so suddenly, but as ashoka mulled over things; and he had already started engaging with buddhism even before the war. i wonder if there are any signs of ashoka in the sarees. 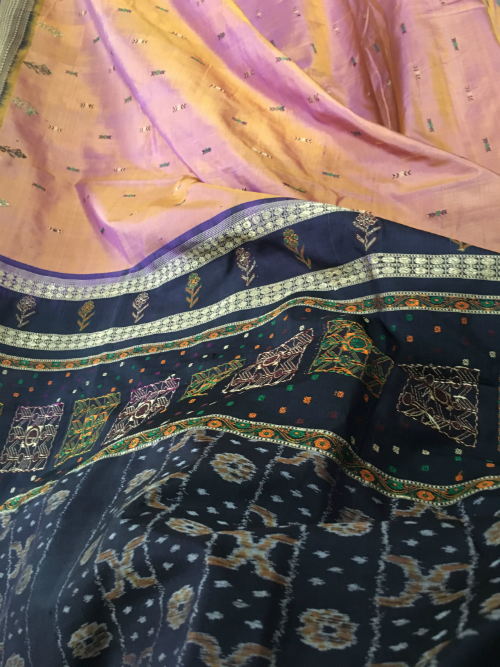 there are motifs of many kinds: wild animals, people, birds, butterflies… i found the butterflies on the borders and pallu of my saree just now. 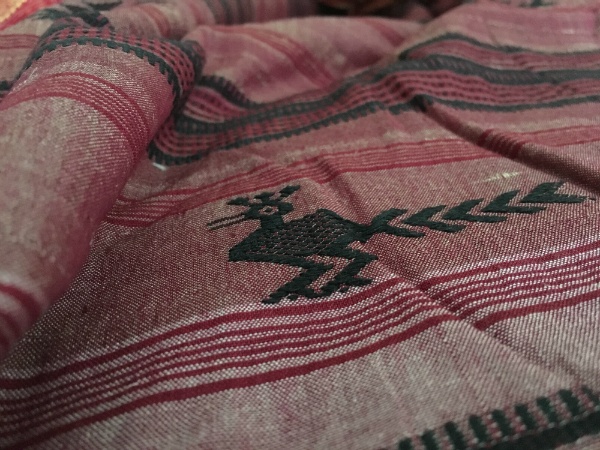 odisha weavers are adept at ikat, the feathery outlines of their weave is distinctive. 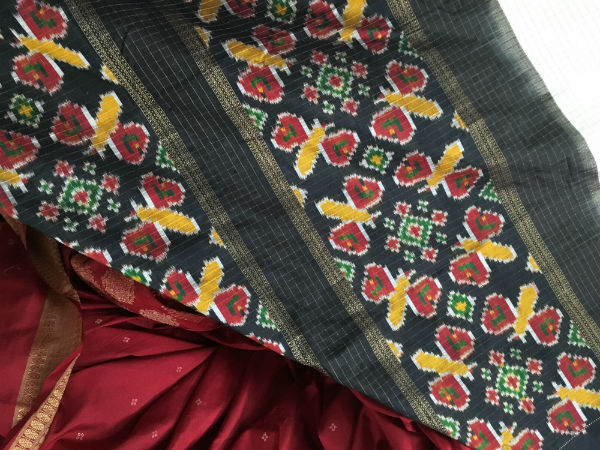 it’s hard to mistake their work for the ikat of gujarat or pochampalli. 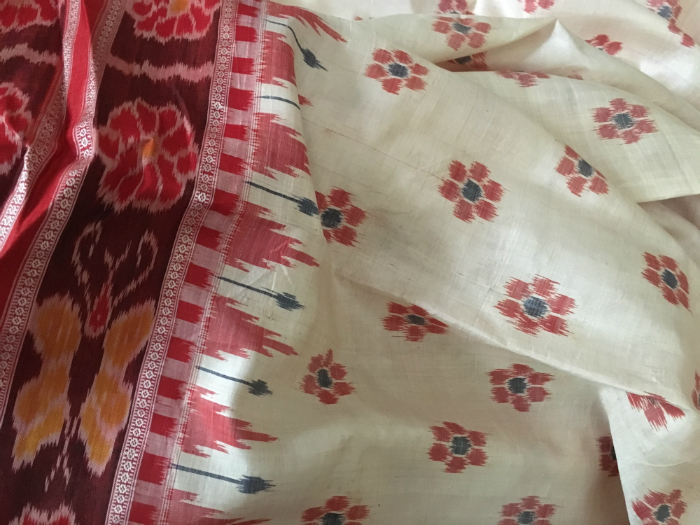 unlike the patolas of gujarat which have bold lines and geometric precision, odisha’s tradition creates patterns with hazy edges, and follows a “curvilinear style”, as i read somewhere. 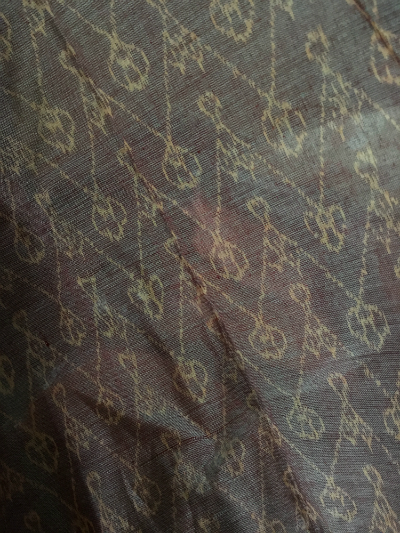 there’s a gentle note to the motifs, a grace in them, almost like the odissi dancer’s. 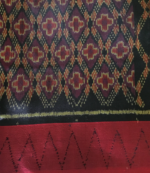 there are also odisha sarees without ikat, like the kotpads made by tribal weavers in southern odisha, who use mainly (perhaps only) vegetable dyes. 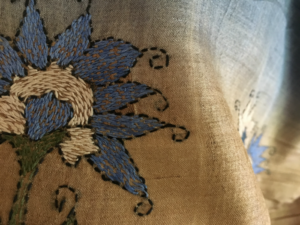 weaving has flourished and declined according to the whims and policies of rulers. i am just glad despite their many games and shenanigans, traditions are not all lost and the art of the odisha looms continue. the base was a shade of pale ivory with a tinge of early dawn pink. or maybe it reminded me of muted basra pearls. 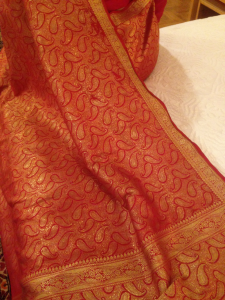 the red of the motifs was so simple and uncluttered, the feathery edges were pretty. it was not an unusual design, nothing about it was rare, i fell in love with it anyway. this was the kotki i wanted. vashdev tolaram was a good shop to go to. 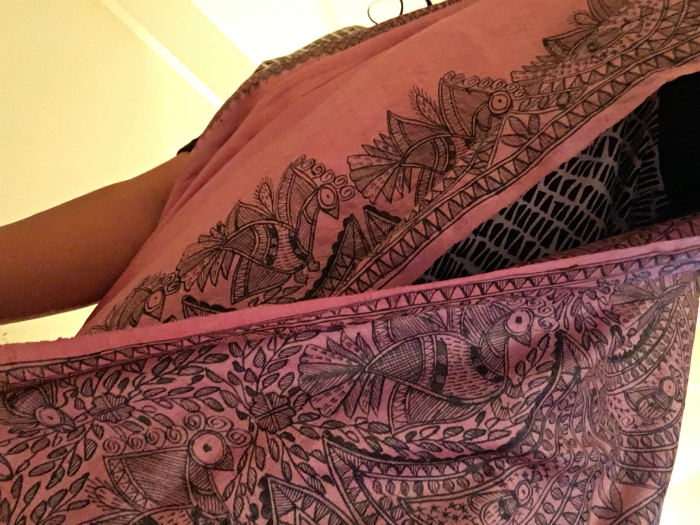 the other day, i pulled out the saree and checked to see if all was well. everything seemed fine, so i wore it. 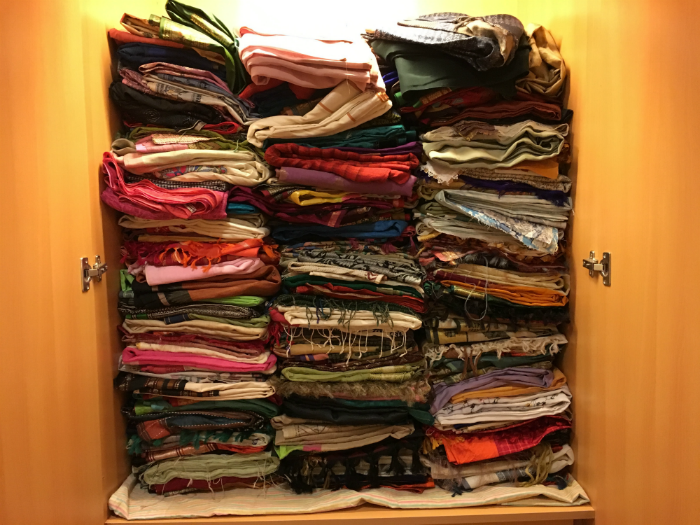 must have been more than twenty years since i’d last felt it rustle and unfold, tumble onto the floor as i made the pleats, turn easily as i drew the pallu and arranged it. i tugged to get something in place, and i felt the first rip. it was a little sound. but i knew what that meant. a funny ache as i felt something precious escape, as if done with being possessed, being owned. 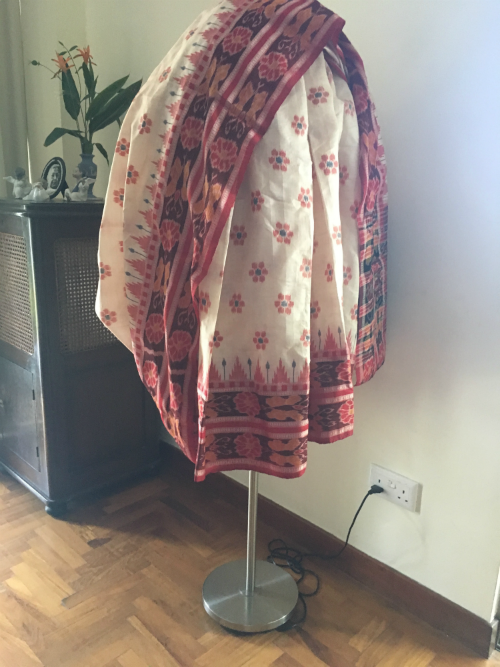 sarees tell stories | pale ivory/dawn pink and red kotki silk from vashdev tolaram, triangular park, kolkata, bought around 1983/84. 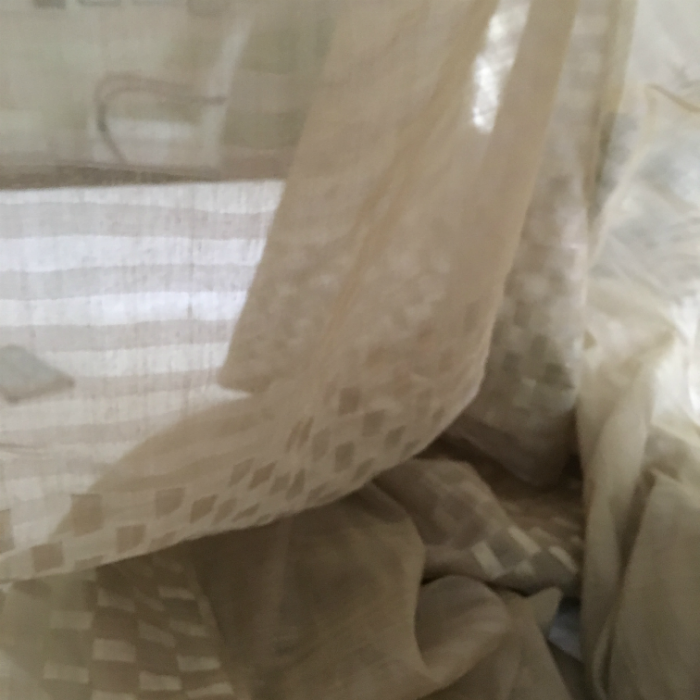 below… grey brown and off white sambalpuri cotton from design & drama, hyderabad, 2017.
thanks a tonne, archana. great to see you. the everyday things, i think that’s what touches and inspires, most of us at writersbrew. hope all good with you. thank you, padma. 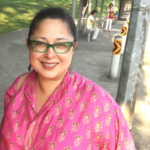 glad you enjoyed the tale of that saree. 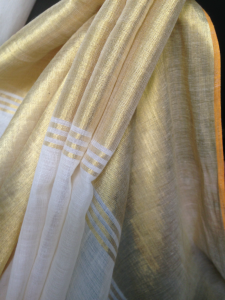 sarees have a way of letting memories, moments stay on them, sometimes hidden for years, don’t they. there are many saree stories on writersbrew, hope you have an enjoyable browse.